Hydraulic Torque: upto 70,000 Nm. 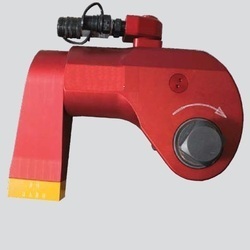 Hydraulic Torque Wrench is a mechanical tool used to provide work advantage in the turning objects, they are applicable in the nuts and bolts. Our wrench is offering uniform working efficiency. Both the flange and cassette types are available in our stock. Used for Torquing and Tightening big nuts with accuracy of 3%. Used usually for nuts more than 46mm A/F. - For high Torque Operation. 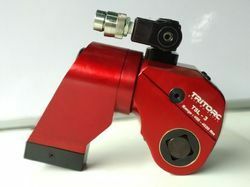 Our range of hydraulic torque wrench provide accurate and precise tightening of nut and bolts. Applicable in various industrial work. Available in various specifications, we also customize products as per the client's need.